A very interesting post on Treehugger is sure to spark some heated debate. Treehugger editor Matthew McDermott has reposted and commented on sections of an op-ed piece from last week’s New York Times. In the Op-ed piece a doctoral student in the philosophy-neuroscience-psychology program at Washington University, Adam Shriver describes possible benefits of genetically modifying factory farmed animals to live (their, albeit pitiable lives) pain-free. He asserts that the research is there to make this possible. But from what we can see on Treehugger, and hopefully on this website, such a notion is grossly wide of the mark – that is to say completely unacceptable. This more than likely goes without saying, but the problem with the Mr. Shriver’s article (not the least of which is his opening attribution to Peter Singer) is the slippery equation between pain and suffering. By reducing the pain in the animals Mr. Shriver also assumes that this will reduce their suffering. We don’t need to go to any lengths to prove such a logical misstep. Look at the picture above. Now imagine it where the animals feel no pain. The picture doesn’t change. Does this look like an environment where there is no suffering? What’s perhaps even more pitiable about Mr. Shriver’s theory (how can this come from a philosopher?!) is the perpetuation of the anthropocentric machine that landed these animals in the cage in the first place. Adam, we should all be ashamed. Even when we try to help these animals we further their demise. For ideas on how to solve meat production problems without continuing to treat animals like slabs of protein flip through the pages found here. His argument hinges on the proposition that neuroscience can lessen suffering, not eliminate it. But in dismissing Shriver, you’ll have to show why using neuroscience is not desirable method reducing suffering. So far that has yet to be discussed. As far as I understood Shriver, neuroscience was being offered as a method to reduce PAIN. Firstly, I think we should be careful to not mistake pain for suffering. There are many ways to suffer (as we all know…hunger, emotional anguish, mental stress etc.) that don’t necessarily inflict pain per se. The idea that just because these animals are not in pain, does not for me, alleviate their suffering. If Shriver can demonstrate to me how to make the cows actually suffer less that might be a different story, except for the fact that we should all be wary of further genetically modifying animals to fit our already overly modified system of food production. And that’s do say nothing of the fact that this kind of objectification is what landed these animals in the factory pens in the first place. But please keep up the conversation! Great point. It is true, neuroscience was offered to reduce pain. It was NOT being offered to eliminate suffering. An unspoken assumption made by Shriver is that pain contributes to suffering. So if we can reduce pain, it helps in reducing suffering. It is not a one-for-one substitution. If you think pain is in no way a contributor to suffering, I think the burden lies with you to say why. I will no lay out my position as to why Shriver makes a good case for the reduction of pain among CAFO animals. The thinking follows a grounding normative principle of Singer’s ethical system: the minimum decency requirement. His version goes: If you’re on your way to give a lecture and happen upon a drowning child in a pool, you would feel obligated to save the child by jumping in the pool and swooping it up, thus sacrificing your $250 shoes. It is obligated because the act is sufficiently easy and produces a morally superior outcome to acting otherwise (assume you have no time to remove your shoes). The case for utilizing neuroscience to reduce pain follows a similar path. We have the technology to limit pain in these animals. Limiting pain reduces suffering (but does not eliminate it). Limiting suffering produces morally superior outcome. Therefore, barring some new development that makes such an implementation difficult or unfeasible, we should reduce the suffering by implementing the availing technology. This does not prohibit us from pursuing other modes of reducing that suffering, like lobbying for the abolition of factory farming, or abstaining from consuming factory farmed meat ourselves. It is merely in of itself an admirable and attainable goal. So as I see it, unless you think implementing this technology has some unaddressed negative externalities (like Treehugger’s assertion that it inflates anthroegoism), I think we need to move beyond whether the technology is a worthy effort or not. I believe we may pursue the technology at the very same time we advocate for more creative and “radical” solutions by the standards of the current CAFO system. 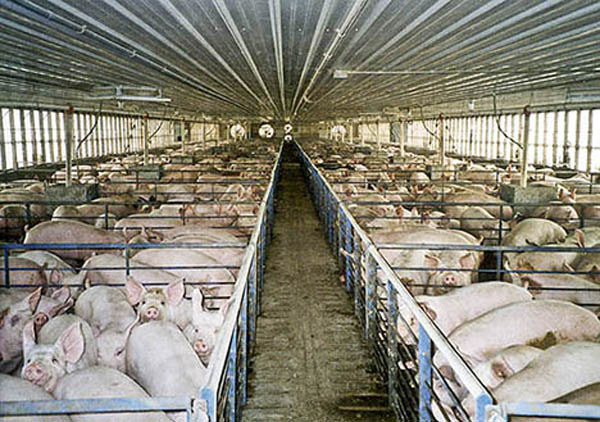 As you know, I myself abstain from CAFO meat whenever possible. Please edit my comment to say “I will now lay out my position…” Thanks! Paul! 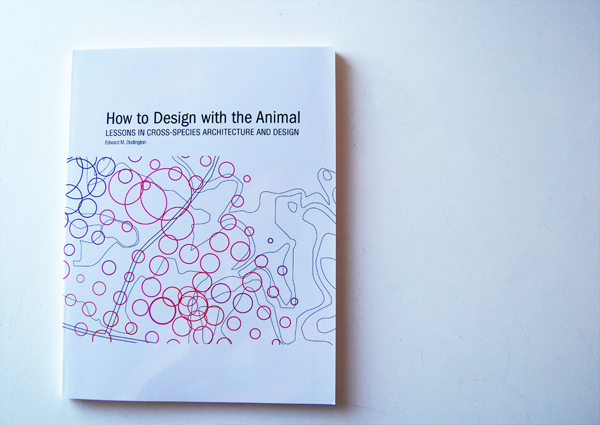 This is exactly the kind of reparte that I love to engage and would love to see occur more often on animal architecture. Thanks again for the time for your well-thought response. As you ask, I will do my best to lay out an argument. First please allow me clarify your response. Your example is slightly misleading. It would be a more accurate example if instead of saving the child, I attached a respirator device to its mouth and lungs, or better yet, had previously designed the child to have gills so that if an when it fell into the pool it wouldn’t feel the pain of suffocation and I wouldn’t ruin my shoes. Do you see where I’m going here? Obviously, reducing the pain in the animal is noble and worthy. To me this is not enough — the ends do not justify the means. Placating the animal to lumber through its life in a painless, though just as miserable a state is to me, a worse, and more pitiable outcome and here’s why. Rather than attacking the benefits of technology I’m am attacking the anthropocentrisism that allows us to presume the right to make these decisions for other life forms. Eliminating pain, even if it made the CAFO animals happy, to me, is just another step on the human-o-centric path thereby only further reducing these beings to objects (slabs of meat). Objects that now painless, we can use and abuse in anyway we see fit. A little thought-exercise might help here to clear the water. In such instances it’s often helpful to switch animals, kinda like you did. But instead of changing the circumstance let’s just place people in the pens instead. I can’t presume to know what Singer would say here, but I would think that we would at least as a group agree that the (now human) animals would be given a choice to feel or not feel pain. Now, let’s remove that ability to choose. Say these humans didn’t have language, or spoke a language we could not understand. What now? Do we just assume that they want a pain free life? Would it infringe on their rights as an individual being to have such treatment thrust upon them? Is a human without pain somehow less human? This is not simply a matter of making life in the cage more palatable, and I should ask who is really benefiting from this technology. If it’s not the animals in the cage, then it’s probably the animals outside. I think you are right to shift gears here and focus on the anthropocentrism at stake in Shriver’s recommendation. As I said, “barring some new development that makes such an implementation difficult or unfeasible, we should reduce the suffering by implementing the availing technology.” In a sense you are proposing that the use of the technology produces a very dear cost in propelling a unethical worldview towards animals (a “new development”). They deserve more respect that the bandaid of a painless existence. I think we may differ on that point. I’m inclined to accept that changing the worldview will take a VERY long time and that during the journey of doing so we should apply all the bandaids we can. You think we should shoot higher and change animal’s lot in the world more immediately. OK. Great. My initial post was not about anthropocentrism, but to defend Shriver’s construction of pain-as-contributor-to-suffering. If you do not wish to engage that point, then I think we’ve exhausted this alley of discussion. I am not at this moment prepared to debate what solutions I propose on a grand scale that would meet the goal of improving animals’ well being. But let’s dig deeper anyway! You grant this to me, “Obviously, reducing the pain in the animal is noble and worthy. To me this is not enough — the ends do not justify the means. ” I think I agree that the means are still despicable. But I am inclined to think that an animal in a pen, or a human in a pen as you suggest, without pain is better off than one with pain. By that measure alone I think we should make it such that the thing in the pen has no pain. Even if the method of reducing pain has its costs — contributing to humans-as-center worldviews — it affects the pain of hundreds of millions of creatures. Refusing to aid in the reduction of the pain of hundreds of millions of animals because it would marginally propel a negative world view is not position I want to hold. Consider: who would even be affected by degrading our worldview? CAFO owners, some academics, armchair philosophers, and a small section of the remaining public. Are you suggesting that their already corrupted worldview can not bear to be corrupted further when the pain of hundreds of millions of animals is at stake? Holding your breath for more pure solutions, I feel, is a bit anthropocentric. The millions of animals in pain right this second do not care if your worldview would be degraded by granting them less pain. They will continue to not care until you make them better off. How long will that be, exactly? If we have the technology to limit their pain now, then we should do so. And pursue the other more pure solutions at the exact same time.